Handling unique pieces is for us a quite recurrent privilege. I know this will sound posh, but that’s our daily job (what a difficult life you’ll admit). Well, the truth is that nowadays, many brands come with unique watches, because of a special request or watches made to create the buzz. However, the three watches you’re about to see are not the kind of timepieces you’ll see everyday – well in fact, it’s a once-in-a-lifetime opportunity to handle the finest from the finest, 3 exceptional unique timepieces made by 3 master manufactures. The point is not to debate on which is the best, but just to show you 3 of the best watches to be auctioned for Only Watch 2015. UPDATE: The Unique Patek Philippe ref. 5016A-010 Minute Repeater Tourbillon Perpetual Calendar in stainless steel reached a stratospheric 7,300,000 Swiss Francs, making it THE most expensive wristwatch ever sold during an auction. in the left corner, the heavyweight, the title holder, Patek Philippe, a brand that fetched almost $4,000,000 with a unique Titanium edition of the ref. 5004 Split-Seconds Perpetual Calendar at Only Watch 2013 and that comes this year in its best shape, with no less than a Patek Philippe ref. 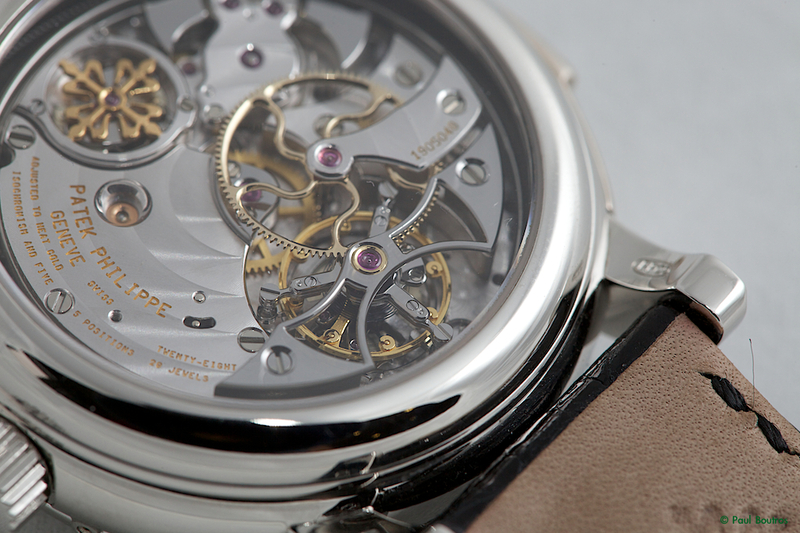 5016A-010 Minute Repeater Tourbillon Perpetual Calendar in stainless steel. In the right corner, two challengers (you’ll need two of these to fight against Patek Philippe), two super-shaped competitors, the Unique FP Journe Tourbillon Souverain Bleu in tantalum and the Unique Kari Voutilainen GMT-6 in stainless steel. What a fight… What a crazy set of watches in front of our eyes. For once, we’ll even encourage speculation and insane prices, considering that the benefits of the auction will go to Duchenne Muscular Dystrophy. Well, this is the big one, the watch that could be THE most expensive modern Patek Philippe ever – please note that we’re talking about modern watches here and not about vintage / antique watches. This watch is nothing comparable with the Henry Graves Pocket Watch (sold over $20,000,000) or with the Patek Philippe 1436 Split-Second in Steel that is about to be auctioned soon (that could easily go over $5,000,000). Why such an assumption? Well, there are several factors to take into account. First of all, the rise of prices in recent auctions. No one can denied an massive increase of hammer prices recently. Then, if you consider the price reached by the unique Titanium edition of the ref. 5004 Split-Seconds Perpetual Calendar at Only Watch 2013, this one could well go over the $4,000,000 barrier, as it is first a more complicated watch, that comes with 3 of the best complications and then, mainly because this watch is out of the Patek catalogue since 2011, making THE only and last option to get your hands on a new Ref. 5016. And it’s unique, and it’s beautiful, and it’s a masterpiece, and… well, you get the point here. What makes this Unique Patek Philippe ref. 5016A in stainless steel so special? Many things actually, apart from it’s surprising come back after 4 years of absence. It feels like our heavyweight, title holder pretender just took some rest before coming back better shaped, better looking, better equipped. Patek has trained its competitor with all the tools they had in their drawlers – and the final result is really impressive. What are the unique features? What is new? Well, neither the Calatrava-style case, not the Breguet numerals or the hollowed Breguet hands have been touched. Same goes for the overall design and the mechanics. 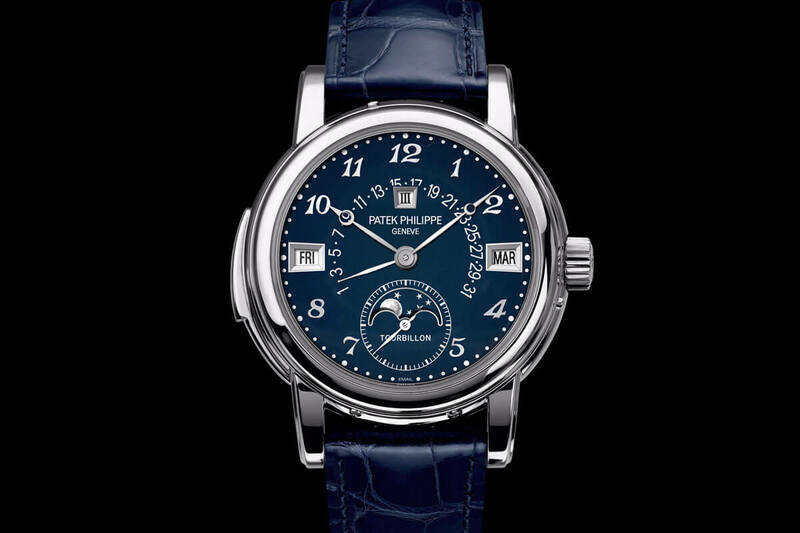 What is new is the combination of a stainless steel case (well you know what happened when a Patek Philippe with such a case is auctioned…) with a blue grand-feu enamel dial. From 1993 to 2011, the Patek Philippe ref. 5016 was one of the most complicated (if not THE most complicated) regular piece from the brand. Besides that, it as also an ode to elegance and distinction, with a very reasonable diameter – only 36.8mm (something you can’t imagine nowadays with such complications) – and a balanced, elegant dial, combining a retrograde perpetual calendar with moon-phases and the superb hands and indexes. And there’s more, much more on the back to see. As usual with Patek Philippe, the tourbillon regulator is hidden and visible only through the sapphire case-back. And you have this massive, superbly finished central wheel on the top of the movement and the two hammers of the minute repeater mechanism – all together with a stunning finish, that is clearly not the same than the normal, cheaper Patek Philippe watches. 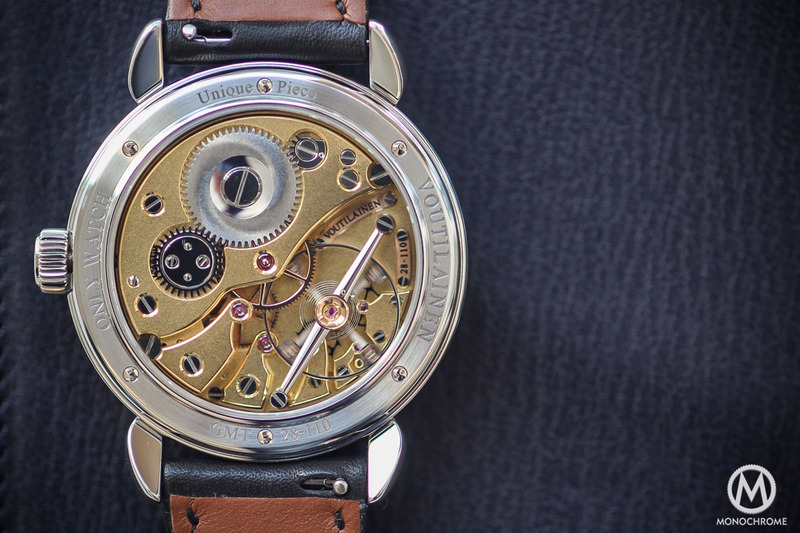 (photo below: the movement from a platinum 5016, by Paul Boutros). There’s no debate here. This watch is mega! It has all the features of a superlative timepiece and of the future record breaker. However, the fight won’t be so easy. Of course, the hammer title will go to this piece. However, like author Blaise Pascal said “The heart has its reasons, of which reason knows nothing“. For the public price award, we also have two stunning names about to enter the arena: F.P. 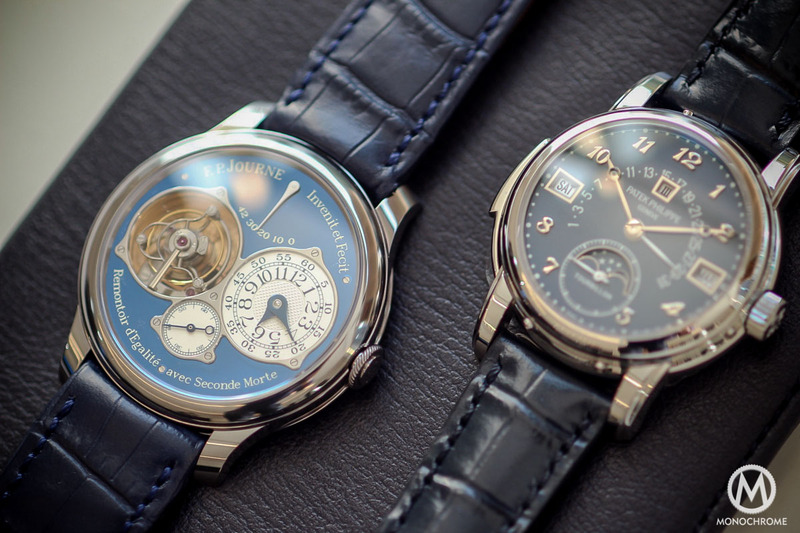 Journe and Kari Voutilainen. 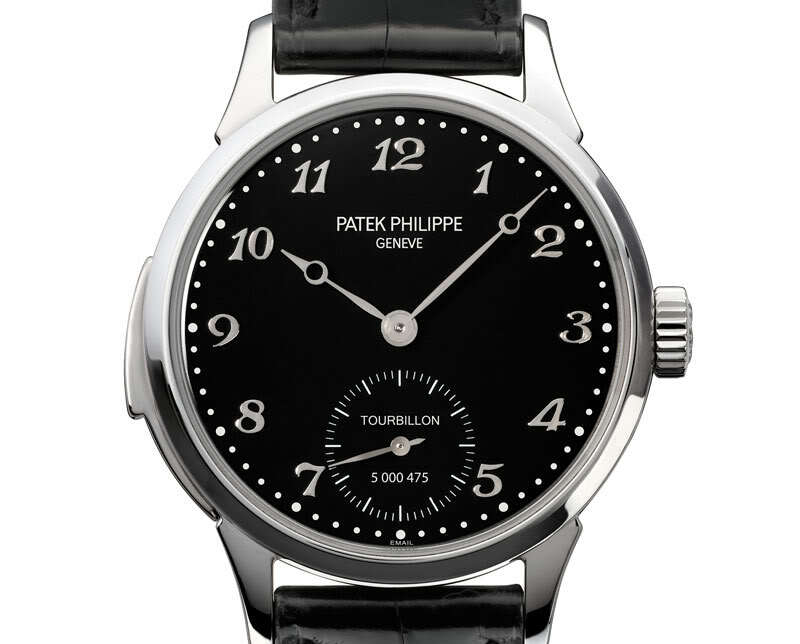 Well, this one will certainly stay in the shadows of the Patek, at least for the hammer price. Because for the rest, what a stunning looking watch, from a stunning watchmaker, with a stunning movement (yes, it’s again difficult to hide a certain excitement here). Both Frank (the founder and editor-in-chief or Monochrome) and I have a real affection for the Chronomètre Bleu from F.P. Journe, with its tantalum case and its absolutely gorgeous blue dial (really, it has to be seen in the flesh. No photo can illustrate the depth of the lacquer). For Only Watch 2015, Journe mixes its signature Tourbillon Souverain with the attributes of the Chronomètre Bleu – and the result is really spectacular. First of all, the Tourbillon Souverain is kind of special for F.P. 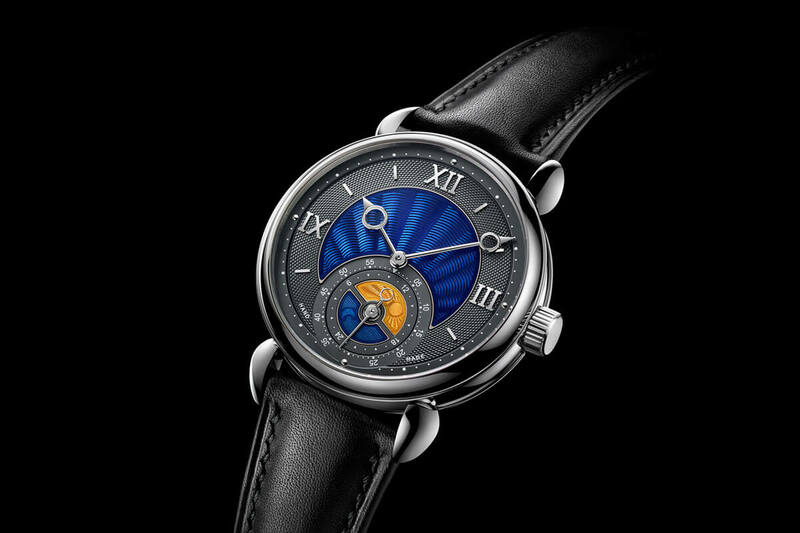 Journe, as it is reminiscent of the earliest watch created by François Paul Journe, the famous “Souscription Tourbillon” – the first 20 wristwatches he ever made under his brand, and just like A.L. 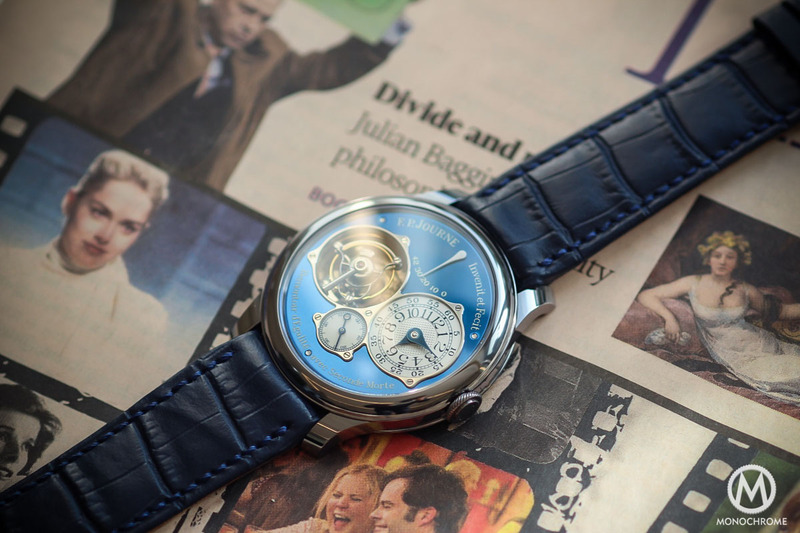 Breguet, Journe used a subscription system to finance the launch of the brand. These tourbillons were coming with the special “remontoir d’égalité”, a sort of constant force device to transmit a flat torque to the tourbillon. 25 years later, the Tourbillon Souverain has evolved (a bit) but still is loyal to the early design (tourbillon cage visible at 9 and off-centrered dial at 3) and to the “remontoir d’égalité”, that is now linked to a direct dead-second mechanism. And as it’s a modern Journe watch, it feature a solid rose gold movement. The F.P. Journe Tourbillon Souverain exists in many variations and even in stainless steel (some rare editions for sure but nor unique ones, as we’ve seen recently with the special set of watches in stainless steel to end the 38mm cases). However, this Only Watch 2015 edition is the first (and certainly the only) occasion to see the Journe Tourbillon in tantalum, a rare, very hard metal with a dark grey / blueish colour. As in the case of the Chronomètre Bleu, F.P. Journe mixes this metal with a blue dial, the same fascinating blue, obtained from multiple polished layers of lacquer that gives in the end a crazy depth to the dial and reflections going from a deep black to a vivid electric blue. Well, in all objectivity, this Unique F.P. 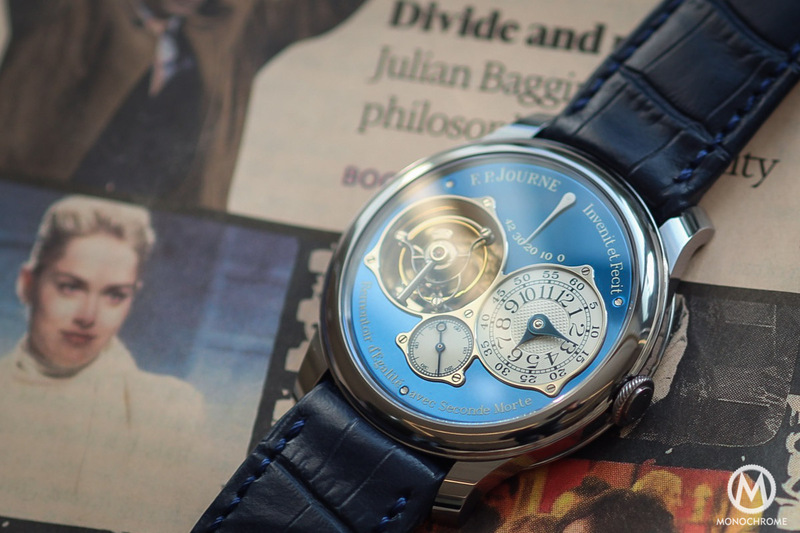 Journe Tourbillon Souverain Bleu in tantalum is not as mind-blowing as the Patek 5016. It’s more simple, its normal execution is still in the catalogue, its name is not as known (this is debatable) but it is emotionally as great, as desirable. 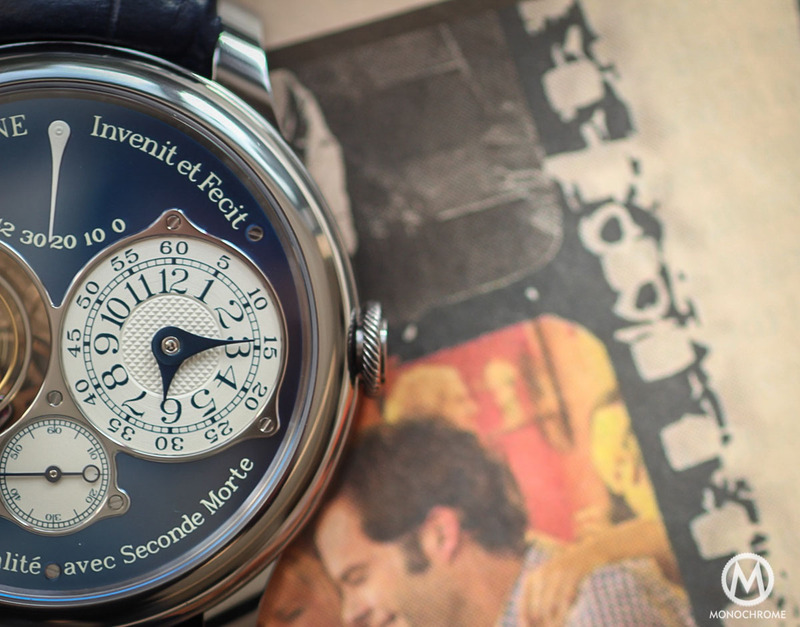 We even wonder why it is not in the regular catalogue of Journe. Last but not least… really not least. Another stunning watch made by one of the greatest contemporary watchmakers (and such a pleasant and humble guy to talk with), the unique Kari Voutilainen GMT-6 in stainless steel. Well, when it comes to Kari Voutilainen, unique pieces are not the exception. Almost all of the watches that come out of this small independent manufacture are unique. We’ve already seen a unique GMT-6, with a stunning art-deco dial. 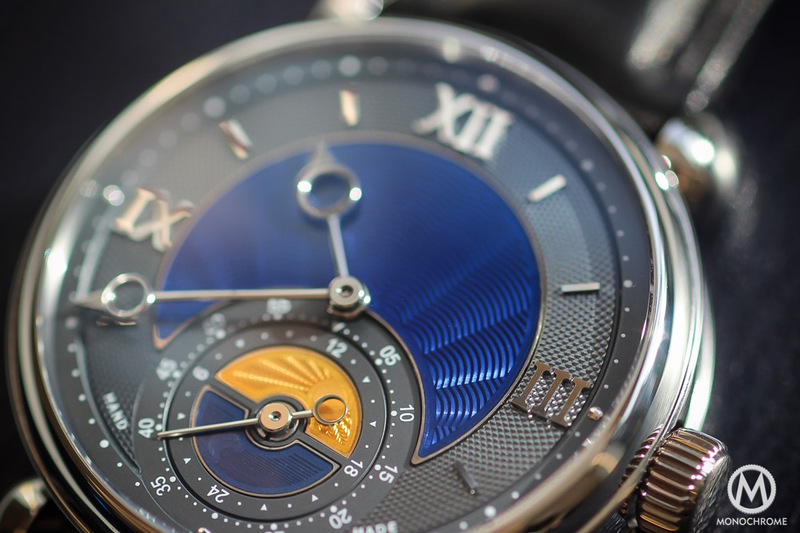 However, for Only Watch 2015, Kari Voutilainen offers a unique GMT-6, for the first time with a stainless steel case. Again, it’s surprising to see the enthusiasm around this poor-man material in such refined and exclusive timepieces (many of the watches offered for Only Watch 2015 are stainless steel editions of watches only existing in precious metals)… The exclusivity and uniqueness sometimes comes from simple things! This steel case is here combined with a unique dial, made of a solid gold hand-guilloché central part (with a wave pattern) then covered with translucent blue grand-feu enamel, one of Kari’s hallmark. The same finish can be seen on the night and day indicator at 6, with blue enamel for night-time and yellow enamel for day-time. However, there’s another masterpiece, the one that can be seen through the sapphire case-back. 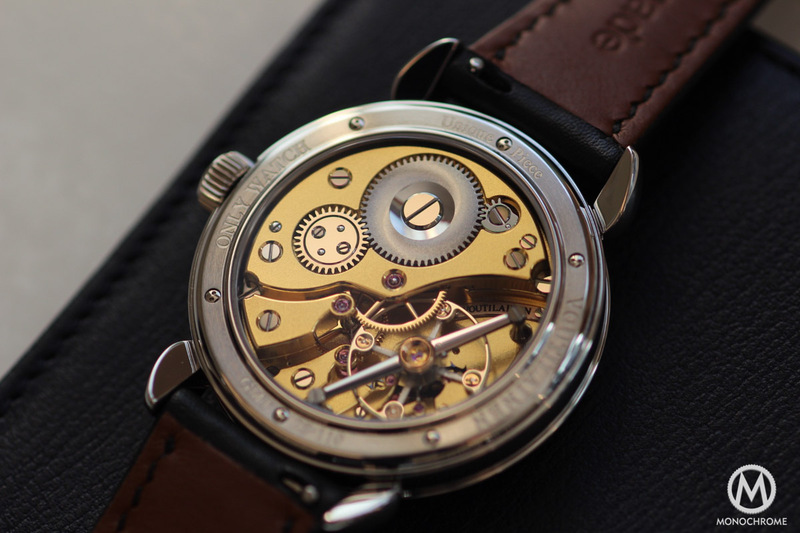 One of the reasons for loving Kari Voutilainen’s watches (among others) is the beauty of the movements, with first a superb hand finish (look at the size of the chamfers on the bridges… and that’s only possible by hand) and the diameter of the free-sprung balance wheel. These two elements sums-up everything. Well, all the parts are superbly finished (by hand, that’s important) for sure and the movement is far from being simple, as it has a special escapement featuring not one, but two escapement wheels (bringing direct impulse to the balance and this construction requires no lubrication). That’s ultra-high-end watchmaking. Period! Again, like the F.P. Journe seen above, this watch is far from the complexity, the exclusivity and the fame of the Patek Philippe. However, in terms of emotions, it has something extra, something personal and poetic, a feeling that only exists in “artisanat“(the French word for handicraftsman. Sorry but this French word best defines the work of Voutilainen). 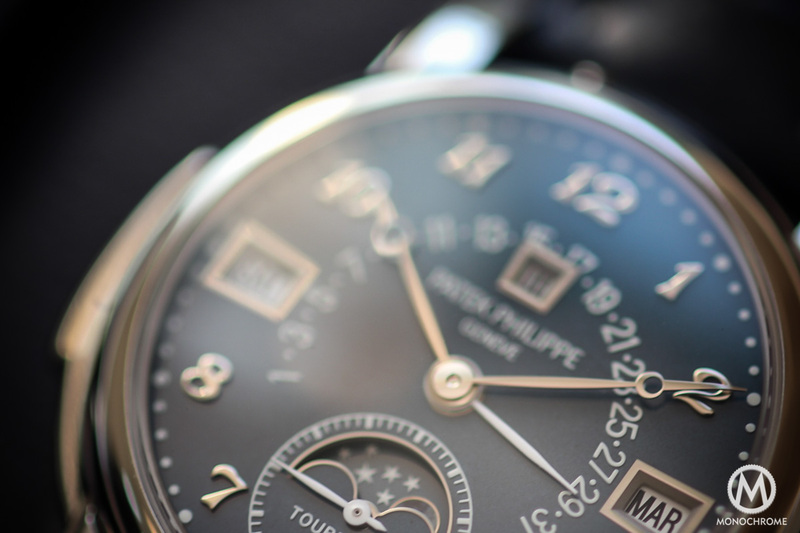 We can’t denied the strength of Patek Philippe and the beauty of the watch in question. It will be, with no doubt, the most expensive piece of the Only Watch 2015 auction. And that’s fine, more than fine, knowing the goal of Only Watch and that all the benefits will help research against Duchenne Muscular Dystrophy. The brands are giving away these watches, so we’ll be extremely happy to see insane, totally unreasonable hammer prices. 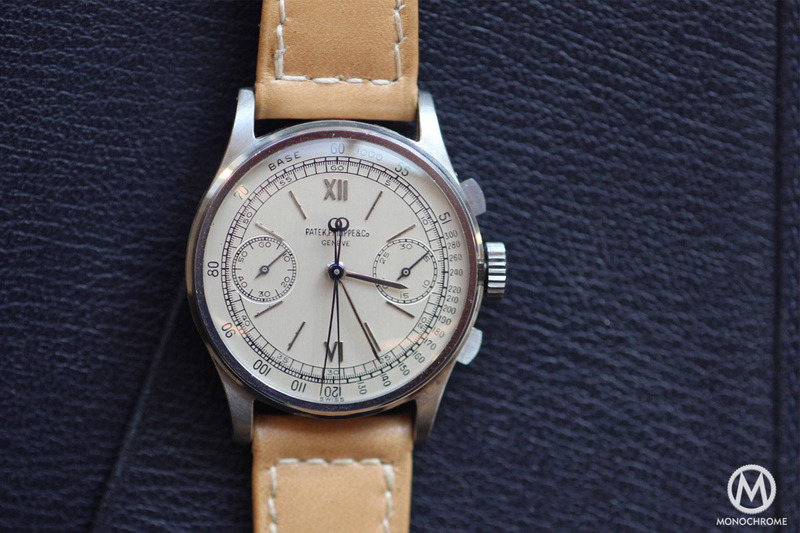 One question though: will this Unique Patek Philippe ref. 5016A-010 Minute Repeater Tourbillon Perpetual Calendar in stainless steel break the ceiling and pass over the $5,000,000 barrier? In a certain way, we hope so, for the sake of the auction – but market-wise, it’s not really enjoyable, making these watches more an investment rather than a pure pleasure object. However, if the Patek is the winner of the battle of the muscles, there’s more to like in the two other watches, something emotional that the Patek doesn’t have – or to say the truth, that the Patek less has. This watch is made by a brand – a superb, iconic brand with one of the greatest heritage – but still, a brand. The two others are made by names, by men. These watches have a direct link with the watchmaker that created them. 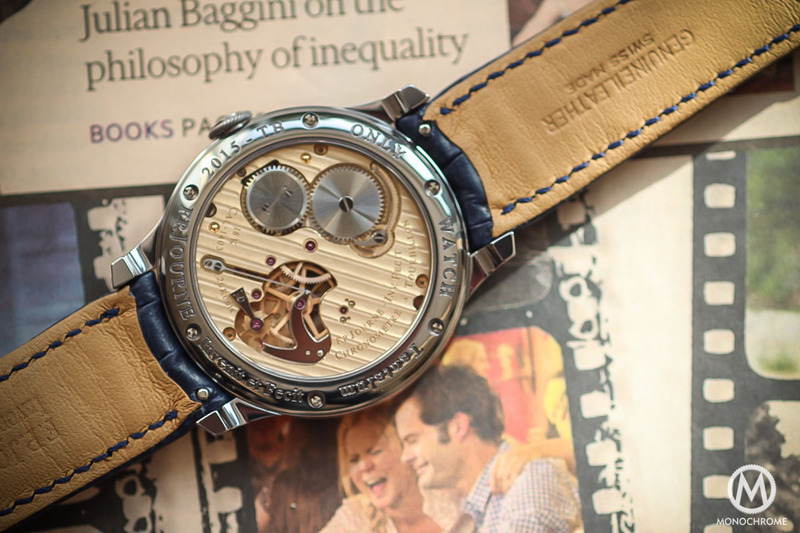 We have nothing against Thierry Stern (CEO of Patek Philippe) but he certainly didn’t participate himself to the conception of the watch – meaning behind a watchmaker bench. 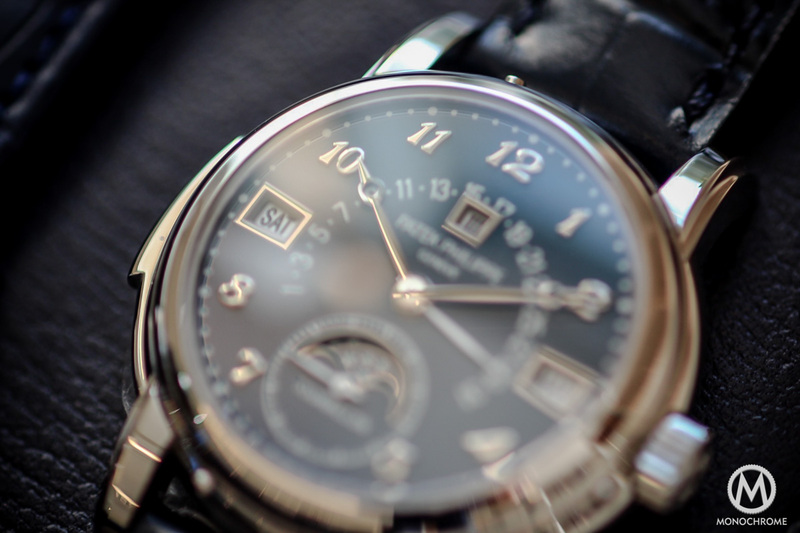 That’s the extra-attribute you’ll have with the Voutilainen and the Journe. Both François-Paul and Kari are proper geeks, using their head and hands to create movements and to design watches themselves. These watches are showing two great conceptions of ultra-high-end watchmaking, but they are intrinsically and emotionally different. In any case, bravo to the 3 brands / manufactures for both creating these stunning watches and to offer them for such a cause. “Dream my son, dream“. UPDATE: gentlemen, we all need to do a standing ovation here, as the Unique Patek Philippe ref. 5016A-010 Minute Repeater Tourbillon Perpetual Calendar in stainless steel was sold for a truly impressive price, reaching 7,300,000 Swiss Francs and making it the most expensive wristwatch ever auctioned. There was no real doubt about it, as the 5016a was the perfect cocktail to be a record breaker: a superb movement, an enamel dial, a stainless steel case, a discontinued model… And the hammer talked. The 2 other watches are not to be forgotten either. The unique F.P. 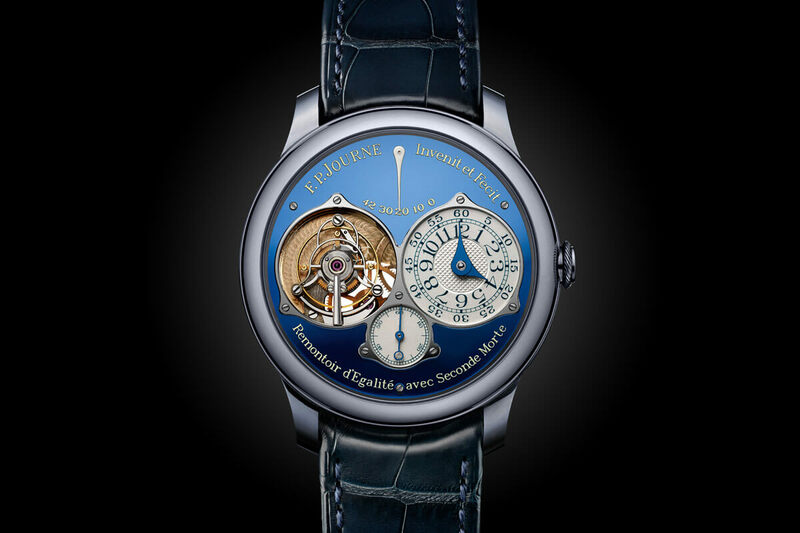 Journe Tourbillon Souverain Bleu in tantalum reached a very nice 550,000 CHF (confirming the interest of collectors for the brand) and the Unique Kari Voutilainen GMT-6 in stainless steel reached 145,000 CHF (approximately twice the price of a regular GMT-6).